An excellent choice for home users and even for small businesses, the Konica Minolta PagePro 1390mf printer offers good quality monochrome laser printing at good speeds. It even offers multiple functions, as the unit is able to scan and fax documents through its ADF unit or the flatbed scanner. The Konica Minolta PagePro 1390mf multifunction printer is nice and compact, though quite larger than other three-in-one devices. 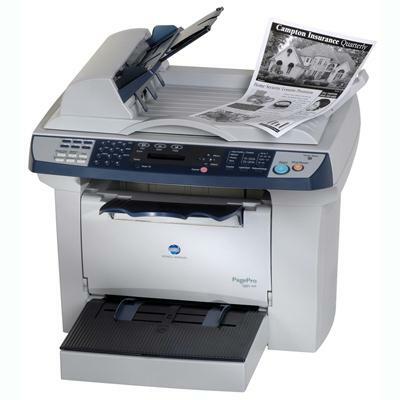 It is a good addition to undemanding work environments, though the PagePro 1390mf lacks a fax. The Konica Minolta PagePro 1390mf monochrome laser all-in-one measures only about 21x19x18 inches and features excellent additions like the ADF unit for automatic scanning and copying of multiple page documents. It is fairly compact and has an easy to understand and master control panel with an LCD display for controlling and adjusting functions and other settings. The Konica Minolta 1390mf laser printer uses a high capacity black PagePro 1390mf cartridge, which ultimately reduce print costs. The best advantages of the Konica PagePro 1390mf laser multifunction printer include its small design, high-quality text prints, and fast scanning and copying functions. Print speeds average 21 ppm, which is good enough for undemanding home office and small office environments. The Konica Minolta PagePro 1390mf laser all-in-one also includes OCR software that scans documents into searchable and editable text. The Konica Minolta PagePro 1390mf, however, does not support fax functions nor does it have networking capabilities. This is why the PagePro 1390mf mono laser printer is best used in homes and small offices rather than in shared printer environments.